Plug and play, ready to use right out of the box. 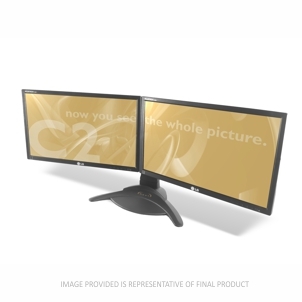 This package includes two 24 inch high quality digital energy efficient displays. Horizontally or vertically mounted to a cast aluminum pedestal, finished with a durable powder coated surface. Pre-cabled for ease of installation. Tired of 'mousing' through documents. Remain up to date at a glance on incoming information such as email or streaming internet data on one screen while working on your primary application on the other screen. Easily interact with spreadsheets and stretch your data between two displays. View displays as one desktop or multiple desktops. Users can direct applications to appear on each screen or maximize an application across multiple screens. multiDisplays allow users can simultaneously view and efficiently interact with multiple resources. All aluminum pedestal requires only 10" of desktop depth. Excellent display solution for all technology users who work concurrently with various running applications or simply require an expanded view of one application.